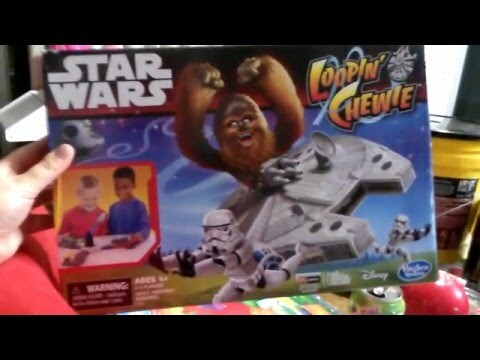 Age range: 4 and up / Number of players: 2 to 3 / Play time: 10 to 15 minutes Manufacturer: Hasbro Millennium Falcon, base unit, 3 paddle arms, 3 paddle units, 1 flight arm on center cone, 9 tokens, label sheet, instructions Loopin' Chewie is out and about and he's going to come after the Stormtroopers with his piloting skills! Every time he flies by in his Millennium Falcon vehicle, he'll be out to knock another Stormtrooper off. But if you can flip him out of the way with your paddle, he'll go after someone else's Stormtrooper! Be ready, though, because he's got some super-dodgy moves! The player with the last trooper standing wins! .